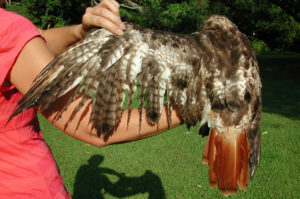 The photos below show a burned American Kestrel and Red-tailed hawk. 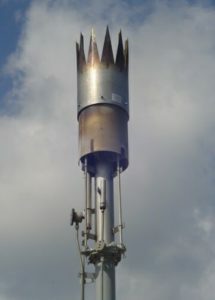 Burners are used in many industries to eliminate gases. In landfills, methane burners are the ‘green’ way to reduce toxic gas emissions produced from decomposing material at landfills. Birds may try to land on a burner that is flaring and scorch their feathers and other body parts. 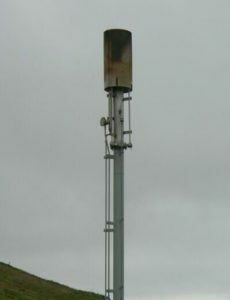 Some burners are on intermittently, so a raptor already perched on the flare when the flare is turned on, can sustain fatal results. Raptors can also simply fly over the flare and singe their feathers, rendering them flightless. 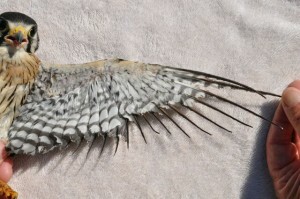 Then they fall victim to ground predators or starve before they can replace feathers. The proactive approach is to retrofit a “crown” on the burner to prevent birds from landing on the top of the burner. Methane burns clear, so the birds can not anticipate what they are flying into. This crown discourages even the prospect of perching with its sharp uncomfortable looking tips and narrow spaces between spikes. This project is supported in part by Covanta Energy Corporation, Nuttall Ornithological Club, Eastern Mass Hawk Watch and South Shore Bird Club.